The Options bar runs along the bottom or right side of your Kindle Fire HD screen, depending on which app or library you open. In some apps the Options bar is always visible; if the Options bar is hidden you will typically see a small black tab with lines on it either on the right side or bottom of the screen which you can swipe to display the Options bar. In other cases (as in the e-reader app) just tap on the screen and the Options bar appears. The items offered on the Options bar change, depending on what library or app you’re using, but they always include a Home button. Also, there are often items such as Search to run a search in features such as a content library and a Favorites button for adding an item to Favorites. In addition, you’ll often see a Menu button when you tap the Options bar. This icon, which looks like a little box with three lines in it, makes available commonly used settings for the currently displayed feature. This figure shows you the options available on the Newsstand library screen. 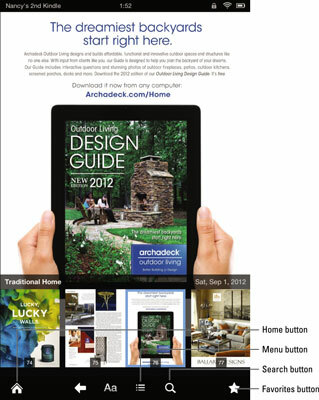 Use the Home button to jump back to the Kindle Fire HD Home screen from anywhere. On some screens where it would be annoying to be distracted by the Options bar, such as the e-reader, you may have to tap the screen to make the Options bar appear.